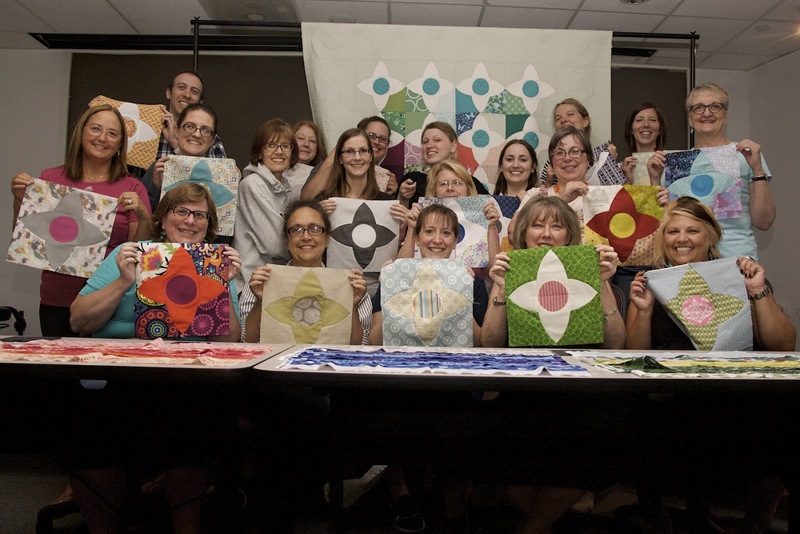 The Philly Modern Quilt Guild was thrilled to host Lizzy House about a week ago for a lecture and workshop. Lizzy's lecture on Friday night focused on her path to designing fabric and the love she cultivated along the way for quilting. The audience had a wonderful time learning about her story, which was heartfelt, inspirational, and overall quite entertaining. On Saturday, a group of about 20 quilters returned to our meeting venue to learn to make Lizzy's Meadow Quilt. It became apparent right away why it is so important to learn to make this quilt from Lizzy herself. She was a fantastic teacher - very kind and knowledgeable - and she took time to meet with every participant individually to discuss their plans for the quilt. 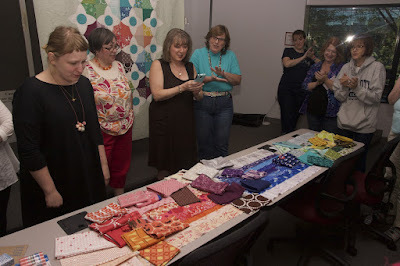 We even had a chance to get a sneak peak of her upcoming fabric line! If you have a chance to take a workshop with Lizzy, we highly encourage you to do so! You are sure to learn something new in a very inviting environment. See below for some more fun photos from our Lizzy House events. If the slide show below doesn't work, visit the gallery direct link instead. It was truly a wonderful meeting! Thanks dear for sharing photographs. Last month I also attended a business meeting in Kenya. The organizers had booked one of the best meeting venues. I really liked that and would prefer reserving that venue for my upcoming international meetings. We can see a lot of things around us which are made for the benefit of us. But we use all these things in a bad way and wasting the beautiful aspects of nature. All the people want to have a great kind of fun in their life so that they can feel very happy from their life. Many people want to have fun with friends and relatives. All the tasks have different stages and steps. One of the most important stages of all tasks is the initialization because you can never finish your work before starting it. Read this very important review regarding the Quantum Code SCAM, before you throw your money away!